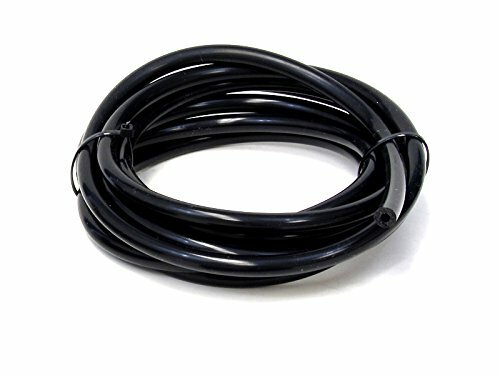 HPS 1/4" High Temp Black Silicone vacuum tubing hose is commonly use for vacuum advance systems, turbo systems, coolant systems, emission control, and temperature range applications. Made of Premium grade Silicone. Heavy wall design gives it the ability to handle extreme pressure. Ultra flexible & Excellent tensile strength.. Key Features: Made of Premium grade Silicone. Heavy wall design gives it the ability to handle extreme pressure. Ultra flexible & Excellent tensile strength. Technical Specification: Product Type: Silicone . Temperature Range:- 65 deg. F to + 350 deg. F (177 deg. C). Hose Inside Diameter: 1/4". Hose Outside Diameter: 0.48" (12mm). Hose Length: 5 feet. Wall Thickness: 3mm. Color: Black. UV and ozone resistant. Remark: Silicone hose is NOT compatible with fuel or oil.